When I was a child, my father occasionally talked about a friend from his distant past who'd been "so smart he was crazy." Apparently—like most dad stories, this one demanded a few grains of salt—the friend's genius was mechanical in nature ("He could invent anything he set his mind to!") and yet he built ridiculous, useless follies, such as a circular house with a huge gear in its basement that allowed for 360° rotation. The story was set vaguely in the 1960s, so it could be that either the inventor or my father had been influenced by the space-age ideas of James Bond movies, or those Matt Helm knock-offs starring Dean Martin. As I understand it now, the story was meant in part to warn against looking too smart (no one likes a show off) or being too intelligent (a normal-range IQ has distinct social advantages). At the time I didn't give dad's cautionary tale much thought since I was so intrigued by the house's unique ability. As for the friend, he eventually became unhinged and was institutionalized. Superior intelligence is commonly thought to be as rare as it is unstable; it belongs to madmen (Jim Jones, Hannibal Lecter, each crazy like a fox and plain old crazy) or visionaries (Nietzsche, Van Gogh, Conrad's Kurtz), and is judged to be a gift that can also be giftig. By no means modest, Alain de Botton's Religion for Atheists calls for a revitalization of the flawed secular world; the book got me to thinking about our distrust of visionaries. As much as we agree that utopian sentiments are admirable (re: the perennial Miss Universe answer/Madonna at the Superbowl proclamation: "World peace"), schemes for actual implementation raise alarms. No doubt we've learned to be skeptical (if not afraid) of practical utopianism; the twentieth century offered a bounty of reasons to be wary of revolutionaries with authoritarian Programs, Plans, and Solutions. When de Botton speaks in general of making the world a happier, altogether better place, I found the rhetoric seductive. Enacting requirements, however, left me cold. Whether mild (restaurants where the seating must be communal, screens in public places that constantly remind us of our cosmic insignificance), or radical (a scheduled time exactly once a year where society would sanction excess and sexual promiscuity, education as repetitive intonation of wise ideas), de Botton's grand vision was a catalyst for my own reaction: to run far away from any such place. As much as I was impressed by the audacity of de Botton's recommendations and the sheer daring of his utopianism, my stronger reaction was fear and resentment: who has the right to force me to share my table with others or to regulate when I must be sexually active or remind me that I, like all humans, am insignificant? The step from establishing and enforcing set social practices for the good of us all to those awful places imagined by Zamyatin, Huxley, and Orwell seems quite small: one day you're free to choose, the following day you're not; and if and when you choose to reject rules and rebel, you're sent somewhere for reprogramming for the good of us all. 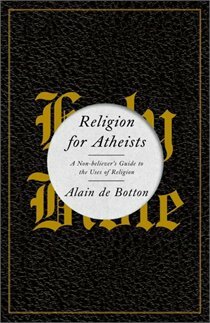 De Botton anticipates that secular readers love their freedom, their choice, and their individuality, and that they'll see evil or madness in his call for remaking the world. Although I enjoyed the book's challenges tremendously, there's no way I'd vote for a political party aiming to make his ideas a reality. Yikes! In the 70's my husband and his parents escaped from a country not completely unlike this. Oh yes, everything is equal, but some are more equal than others. They told me about how there was nothing in the shops to buy, but how there were special shops just for party members. So much for equality! I'm with you. I run far away from lack of freedom. De Botton's intentions are to make the (secular) world a happier, more connected place. He's eager to get rid of alienation and loneliness and what he sees as a widespread sense of being disconnected. I don't think he wants to become the Totalitarian Ruler who wants everyone to bow to his absolute will. Still, it seems that as soon as any person or political party says something like, "For the betterment of humanity, all humans must believe X or do Y," it's not too long before we're living in a country looking like the place you mentioned you escaped from in the '70s.